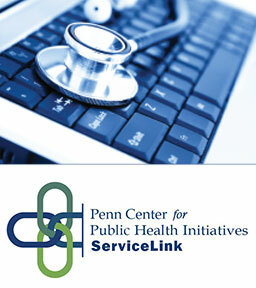 Established by Penn's Center for Public Health Initiatives in 2011, Service Link sends dedicated undergraduate, post-baccalaureate, medical, MPH, and law student volunteers to primary care and community sites in Philadelphia. Our mission is to improve the health of Philadelphians by linking them with public benefits and community resources that address their non-medical determinants of health. Service Link, a student organization dedicated to improving the health of Philadelphia's most needy, is looking for students like you! Through Service Link, you can interact with patients and families to make a significant difference in their lives. By linking them to needed public benefits and community resources, we work to help low-income Philadelphians overcome any obstacles to their holistic and deserved good health. Service Link sends volunteers of diverse backgrounds to a variety of sites, where they can work closely with patients to secure basic living and health needs including health insurance, healthy food options, utility payments, prescription payments, and legal support. Volunteers should be prepared to dedicate 3 hour blocks at least twice per month. Beyond these regular shifts, volunteers must attend training sessions and certain events throughout the semester, although these external time commitments should only total around 5 extra hours per semester. To be considered for the Service Link team, complete this application by 11:59 pm on Wednesday, January 30th, 2019: click here. Email servicelinkatpenn@gmail.com if you have questions and follow us on our Facebook page (www.facebook.com/servicelinkatpenn/) for updates. Our model builds on a model first initiated by the Health Leads program headquartered in Boston. Service Link has over 40 volunteers and is recognized by the undergraduate service and graduate student umbrella organizations, CHAC, and GAPSA, respectively.